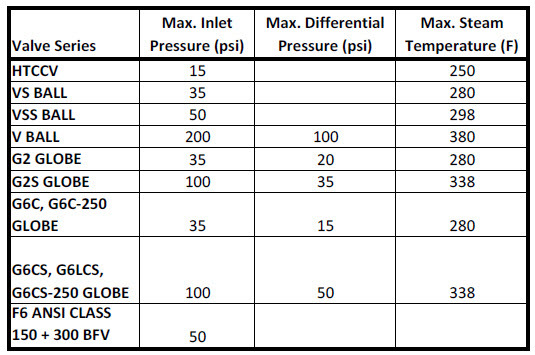 Maximum inlet pressure along with maximum differential pressure and steam temperature are the most important considerations when selecting a valve series for steam service. When sizing a steam valve, the inlet pressure, flowrate, and type of actuator control (on/off, floating, or proportional) must be known. Our free SelectPro software is a useful tool for steam control valve sizing and selection, or you can manually calculate using the document attached below. NOTE: If the inlet steam pressure to the heat exchanger has been reduced from 100 psi to 15 psi, for example, the valve close-off pressure requirement is 15 psi. However, the steam dryness factor will cause the temperature of the 15 psi steam to be between 250 to 338 degree F.